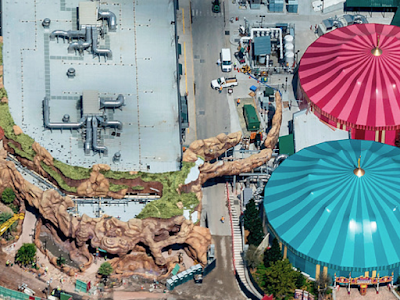 About three and a half years ago I published a little essay called Go Away Green, discussing the illusionistic aspects of disguising show buildings inside theme parks. What are show buildings? 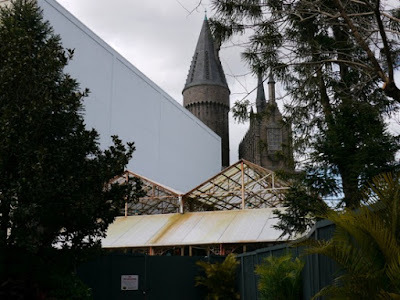 They are those big ugly unthemed warehouses which house the sets that the actual attractions take place in. This doesn't count as spoilers any more, does it? Quite unexpectedly, Go Away Green turned out to be one of the most consistently popular essays I've ever put out. I think it speaks to the ongoing interest not only in the "backstage" aspect of theme parks, but in the nuts and bolts that go into making a place work. It takes a lot of dedication to care too much about those big featureless walls, so perhaps a followup is in order. 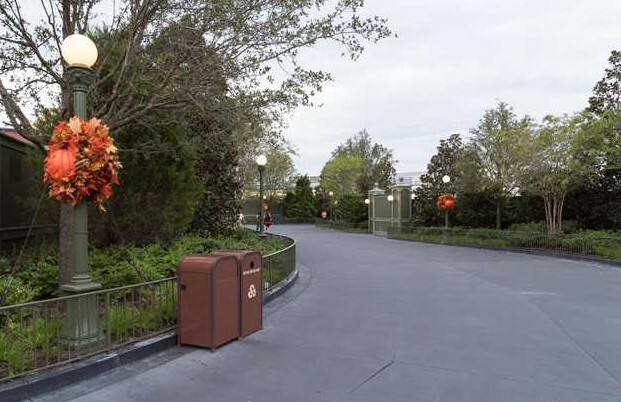 Moreover, a lot has changed at Magic Kingdom since 2012. 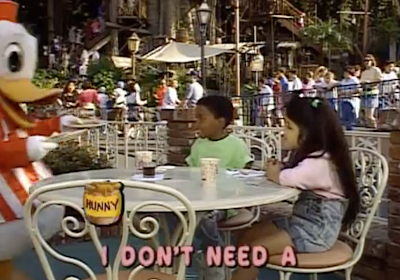 A Fantasyland expansion has come online, previously empty restaurants have been reinvented, and the entire center of the park was demolished and rebuilt. That's a lot of places which previously had very obvious exposed show buildings. What is to be done about them? ...or that the red rocks of Utah are visible from the front lawn of a New Orleans cafe. It's just the way things work there. Magic Kingdom's designers made a more consistent effort to visually integrate the various areas of Magic Kingdom, but there wasn't much more of an effort to screen the areas off from each other. 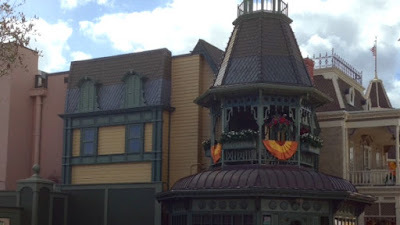 You can still see parts of Fantasyland from Liberty Square, parts of Adventureland from Frontierland, and so on. 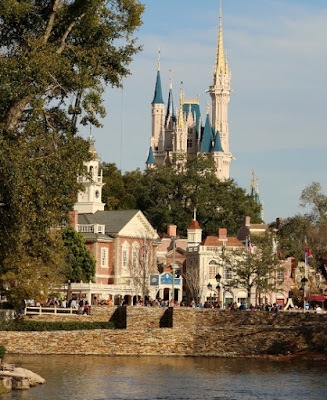 There is a move towards subtle visual integration - notice how the shape and size of buildings in Liberty Square subtly echo the shape of Cinderella Castle - but WED Enterprises was still content to allow everything to smush together organically. It's part of the fantasy nature of the park. Flash forward to 1992, and Disneyland Paris - by far the most integrated effort at a theme park yet - didn't just have a berm around the entire park, but berms separating each themed land from every other one, too. With the traditionally allowable exception of the castle, once inside any of Disneyland Paris' lands, everything is screened off. It's even almost impossible to see Big Thunder from the top of the Swiss Family Treehouse due to very careful positioning. 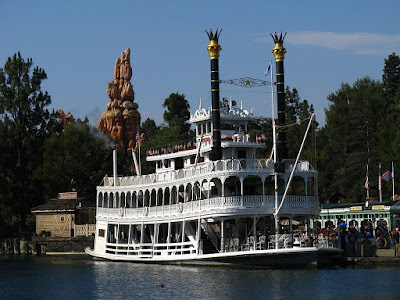 Each "land" in Disneyland Paris is treated as if it is effectively a separate theme park. WDI carried this quite far. 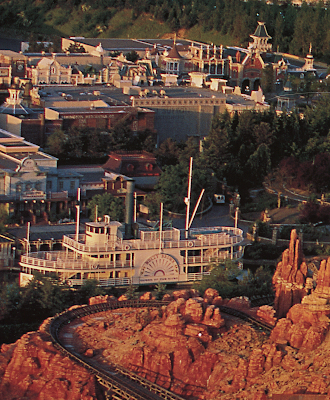 Due to the practicalities of running a theme park, Main Street and Frontierland sit right next to each other. 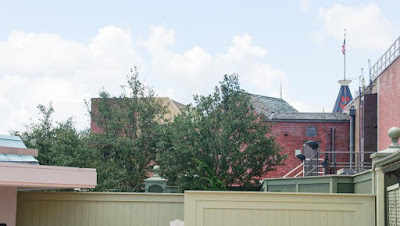 Not to be outdone, the rear of the Frontierland buildings facing Main Street have Victorian false fronts, and the rear of Main Street facing Frontierland is disguised as barns. It's all very intricate and impressive. My question is: does any of this at the end of the day really matter, or is this just the sort of thing super-fans (and theme park designers) care about? Does anybody except readers (and writers) of blogs like this really care that It's A Small World has nothing to do with the rest of Fantasyland? In my original post I pointed out that around 50,000 people a day walk under the gigantic unthemed wall in Magic Kingdom's Fantasyland and never give it a second thought. They simply don't see it. I compared this to misdirection in a conjuring trick - real-life stage magic. In short, I'm still not at all convinced that in the end this matters all this much. Don't get me wrong - disguised infrastructure like the examples above at Disneyland Paris fill me, as a park fan, with delight. They're one of the reasons I got into this in such a heavy way. I stopped my touring of Disneyland Paris to admire them. So it's in those specific terms of praise that I think the following discussion should be couched. As a fan and admirer of park design, I think it's great that WDI finally addressed some of the lapses in theme which I will single out below. Yet, in the larger sense, I also think it's worth being skeptical about the objective value of such things. In the end, after all, isn't this all to some degree just a game? Enough preface, let's look at some show building.... camouflage. In 2015, after a year and a half of on-again, off-again work, Magic Kingdom finally finished up a long-delayed bypass around Main Street. Disneyland built one too, and while Disneyland's is a lot of walls and only used on emergency occasions, Magic Kingdom ended up with a wide open air boulevard that they end up using basically every night. They compensated by filling the whole thing with trees. ...have been somewhat filled in and give a sense of some remove between areas. 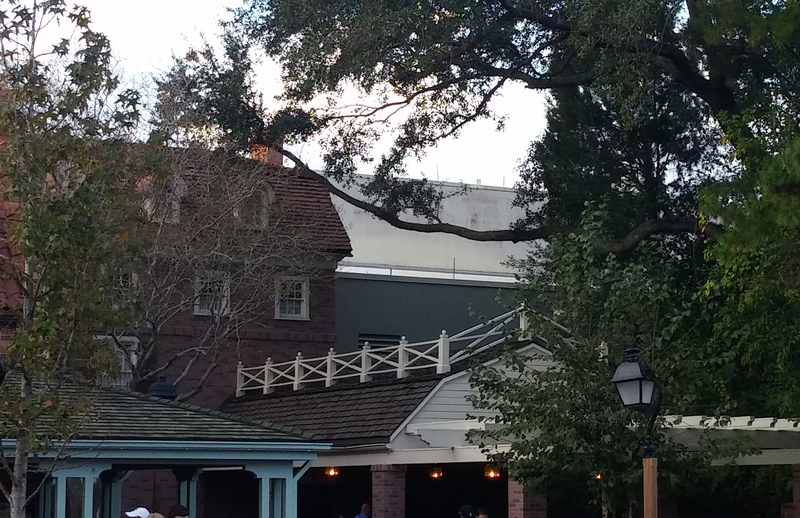 Until the late 90s, large trees were planted behind this wall to block views like this, and even if it's due to a firework crowd flow outlet, it's nice to be able to stand on Main Street and enjoy the illusion of a park just beyond this wall again. Other rough corners were not exactly removed so much as covered up to the point where only the truly sharp eyed would notice them. 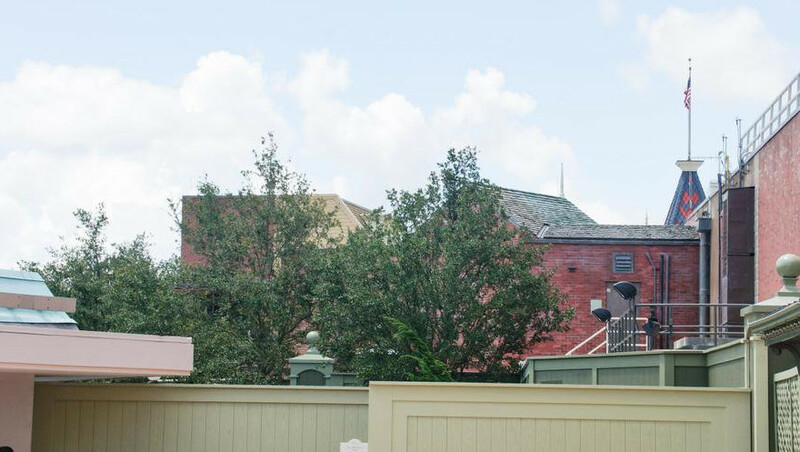 On the Hub side of Main Street, the most visible gap of theming in Magic Kingdom - the entirely visible rear of Main Street - is no more. The rear of the buildings, once painted in Go Away Green, now have painted on brick details, interestingly acknowledging that this is the actual rear of Main Street for any who would bother to look. 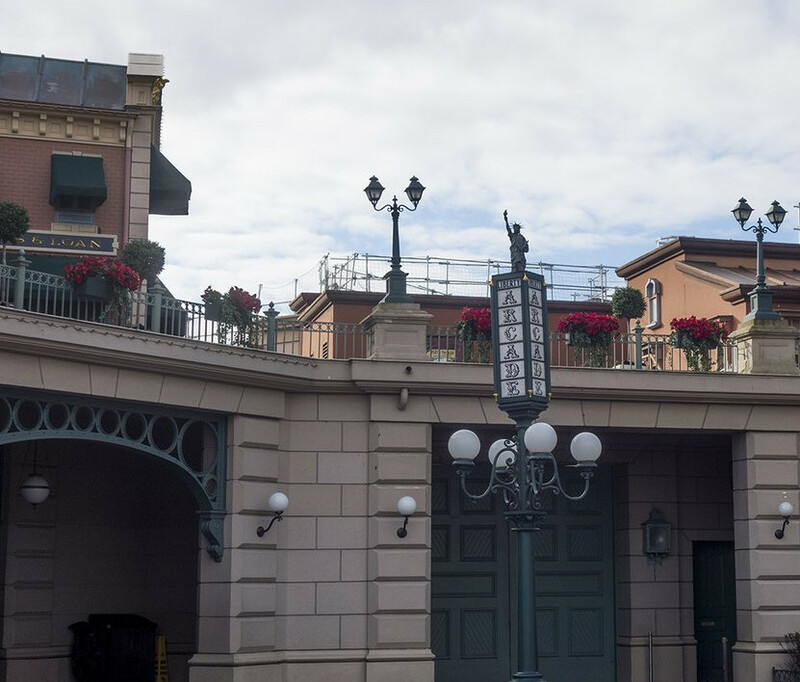 The remaining protrusion onto the Hub, the side of the Plaza Restaurant, received a rather simple dimensional facade wrap and a few new trees. This doesn't stand up to close scrutiny, but as I pointed out in my original article, very few will choose to look at this as opposed to the gigantic castle off to the right. Over in Fantasyland, so much of the area has been redeveloped that a great deal of modification of sightlines had to take place. New walls have done up to block rooftop AC units (one wonders what modern WDI would make of the endless miles of plain white roofs once visible from the Skyway), and extra paint has been brought in to disguise plain walls. To me that looks like a rock floating weirdly in midair, but I guess at least it isn't the view of the back of a corrugated metal shed. It's worth remembering that Disneyland mostly just lets her architectural style smash together like two trains. 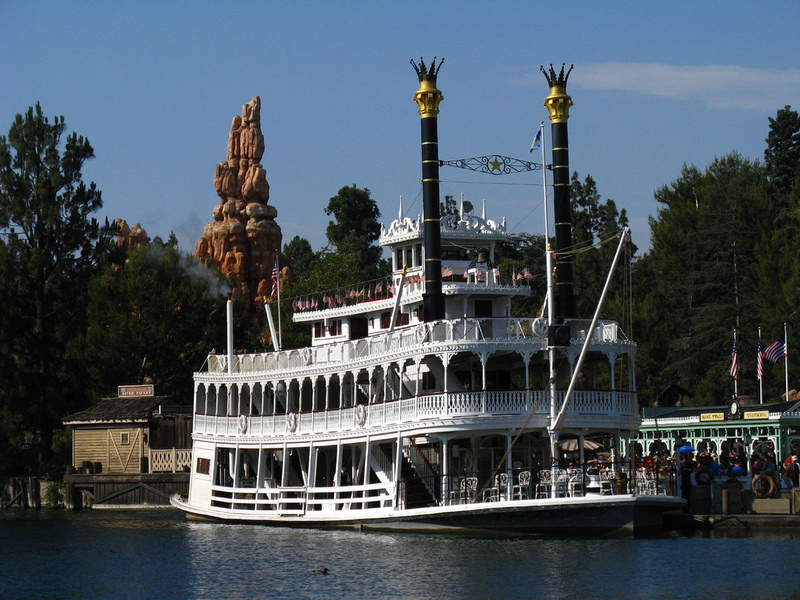 The concept of transitory architecture was pioneered for Magic Kingdom. 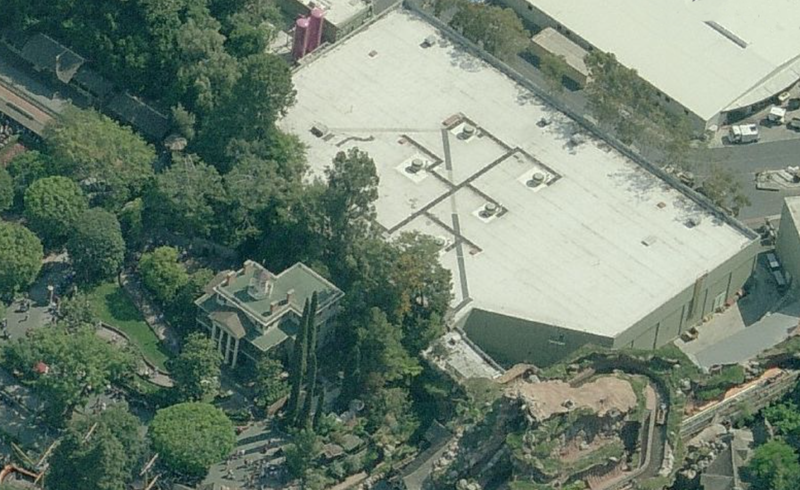 But on the other hand from the train it's very easy to see the stark naked rear of Pirates of the Caribbean, Fantasyland, and the unthemed overpass which I remarked on in Ten Big Design Blunders. 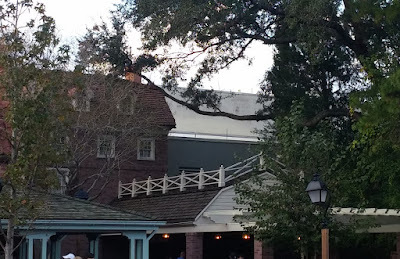 Now that the backside of Main Street has been painted over, filled with trees, and basically banished, this is probably the single largest intrusion of the "outside world" into Walt Disney World left. 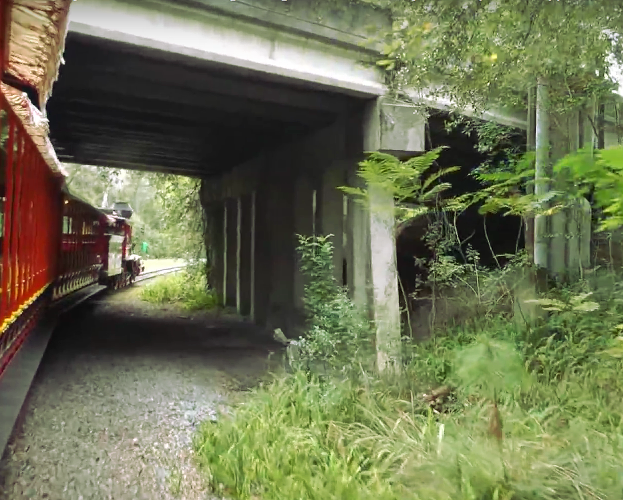 Or this illusionistic slight of hand on the Disneyland Railroad which passes by so quickly it's easy to forget it's disguising a giant warehouse as... a giant warehouse. Again, we must ask: does it truly in the end matter? I think in order to answer that we have to question the extent to which a non-committed audience is likely to respond to the little holes where the illusion slips out. Many guests don't even see obvious details, never mind these weird little gaps where something unintended slips through. 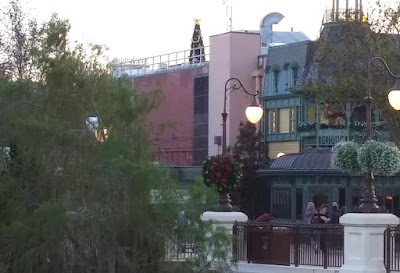 You can technically see the Contemporary from Liberty Square, but almost nobody bothers to look to see it. To what extent does something that's basically subliminal affect the overall perception of the whole? Tokyo DisneySEA goes to unprecedentedly elaborate means to screen out its back-of-house areas from guest view. If even subliminally, touches like that add to the luster of the park, and make it seem like a more impressive, a complete package. Disneyland Paris and Tokyo DisneySEA enjoy sterling reputations in part because the detail they are built with is staggering. It's possible that even if the majority of audiences don't stop to look at every little thing, the mere fact that it's there impresses on them in some subliminal way. This is why I think that sweating the small stuff adds up. The measurable difference is played out every day in the park - in reputation, word of mouth, and demand. Mind-boggling spectacles like The Haunted Mansion, Pirates of the Caribbean, Tower of Terror, The Amazing Adventures of Spider-Man, Harry Potter and the Forbidden Journey, and Kilimanjaro Safaris still do command long waits because word of mouth has made them into the tentpoles of their respective parks, and audiences respond to them for the crazily elaborate experiences that they are. They may not see everything, but the richness of the experience alone is arresting. But it's worth remembering that Disneyland and Magic Kingdom are unique. 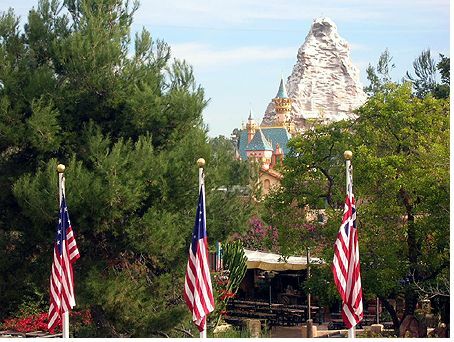 Compared to something like Disneyland Paris, the design of both of the stateside parks is far less intricate. These parks are stepping stones towards the modern extravaganza parks represented by an Islands of Adventure or a Tokyo DisneySEA, and to some extent I think they should stay that way. Magic Kingdom is the last Disney park to have that sense of naive architecture that you get at Disneyland. Yes, it's bigger, and yes, over the years Disneyland has made the texture of their park much more intricate. But intricacy is different than sophistication, and I wouldn't want to live in a place where weirdo design touches like those logs holding up those Magic Kingdom facades or that too-small-for-people bridge in Disneyland's Adventureland were "sophisticated" out of existence. These places are, after all, historical objects as well. Floating around the perimeters of theme parks, show buildings are the white phantoms of the art form - ever present, rarely seen. In a place so full of richly satisfying distractions, isn't it interesting how much we can learn about them by choosing to look at things we aren't supposed to see?